It's been a couple of months since I last posted any jewellery so today I want to share a bracelet I made on Sunday. I came across Bead Worx at Harbour Town (on the Gold Coast) last week where I found these neat yellow, brown and white glass beads. Don't they remind you of bees?! So I scouted through all the hundreds of jars of beads lined up on the shelves until I found some flower beads that I thought would work with them. 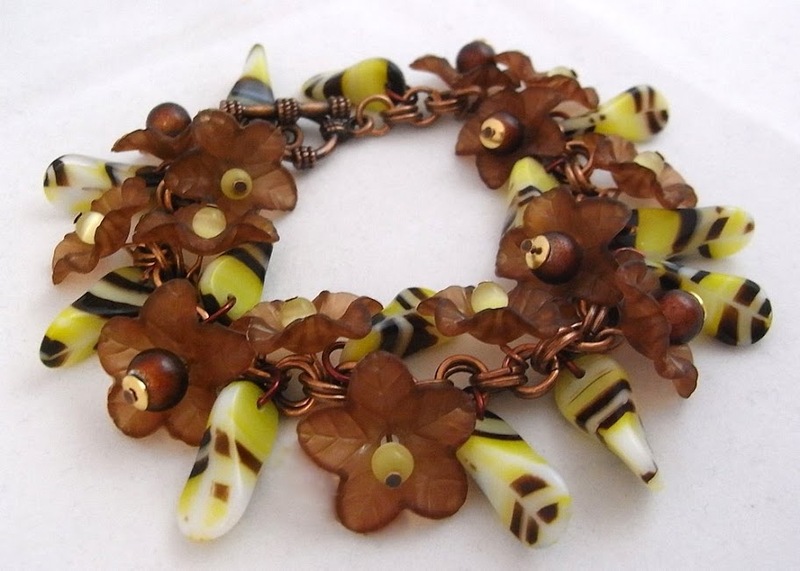 I also added a few cats eye beads in lemon yellow and some miracle beads in a rich shade of brown. I liked this combination of colours and shapes but neither gold nor silver worked with it (except for those tiny little gold bead caps which add a nice flash of contrast!). Antique copper was a much better choice but as I didn't have any pre made chain in that colour, I made a simple chain from jump rings as the base to attach the flowers and beads to. The second row of jump rings has made the bracelet really strong and it was quick to make because the pattern is so simple. The bee beads needed to be reamed because the hole goes through quite a thick part of the bead and my 4mm copper jump rings just couldn't curve through that straight hole. I ended up making some 4mm jump rings from 20g brown artistic wire and that did the trick! I threaded all my beads on copper head pins and turned a loop in each one, then attached each one to the base chain distributing them evenly along the length. I finished it off with a simple toggle so that it could be undone easily with one hand. The antique copper jewellery findings and metal beads are from Eureka beads - I always stock up when they visit Brisbane for the various craft shows throughout the year. But they also have an online shop for when I've run out of what I need. Ooh, that's gorgeous!!! Love the step by steps, but I would love a larger image of the tool you used to make your jump rings. I have a coiling gizmo clone, and it's not bad at all, yours looks really groovy! Love the bracelet! Really nice!!! 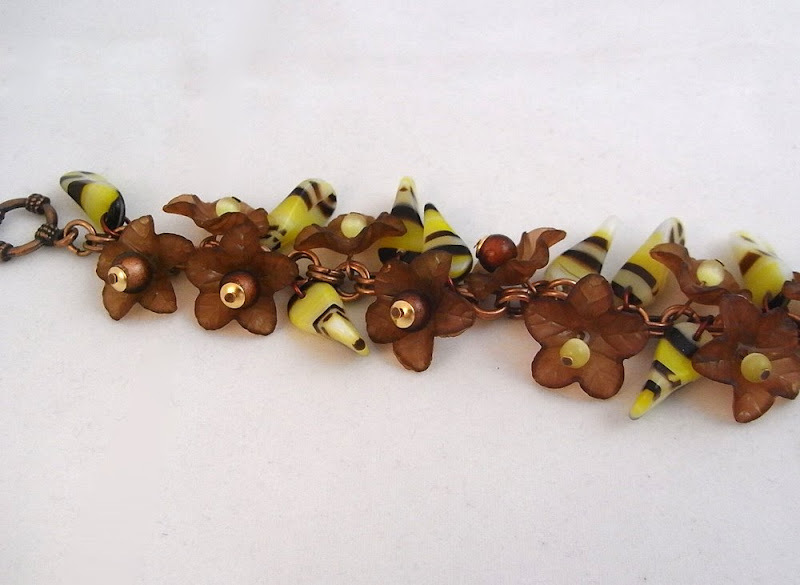 Lovely bracelet Mylene, the flowers go so well with the "bees" :) . Very very pretty.